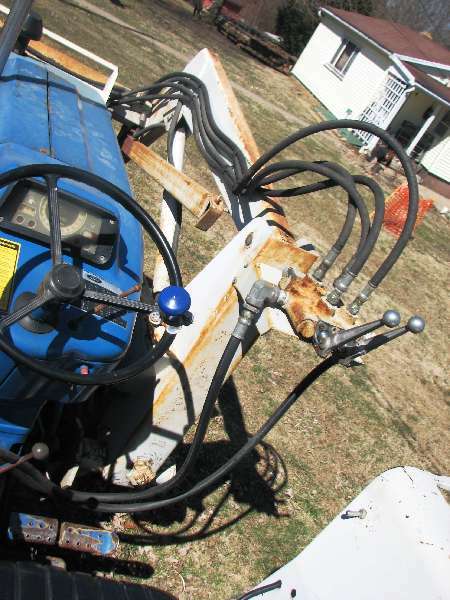 I am trying to find chains for use in snow with my Kubota B7800. The Kubota specs say that I have "23X8.50-14R4" on the front and "12.4-16R4" on the rear. When I go to look at tire chain charts, I see the following chart. Anyone know how to match these up? This is the 'agricultural Duo' I believe. Charts are available for Ag Duo, Ag Ladder, Ag Double Ring, and Lawn and Garden. Maybe my problem is that the R4 tires are not considered 'Ag's? Thanks much for any advice on this! Frank, first off, don't worry about your front tires, with the rears chained you won't need the fronts chained, and it's hard on the drive train, aside from being a real PITA to get them on and still have the necessary clearances. The rears are explained like this, the size 12.4-16R4 means they are 12.4" wide and meant to go on a 16" rim, and have an R4 (or Industrial) tread style. You are correct R4 tires are not the same, or even the same size as AG tires are. OK, 12.4x16. Does that mean I should be looking on the Lawn and Garden page instead of Agricultural Tires page? I see some that get closer there - 12x15 (not 12.4x16) but they have another number. Maybe I will have to measure the actual height of the rubber to go forward. Or maybe I need to find a new place for tire chains. I guess we are not supposed to have URLs in these messages, but if you know of a place for me to go, please email me. BTW, Don't we need front chains for traction for steering? In terms of clearance, they seem pretty exposed as I remember, although I am driving my PC right now and don't have the tractor handy. Just curious! How do you know you even need chains, with 4WD you have phenomenal traction. Have you tried it and failed without chains? Frank, while I've never dealt with these people personally, I've heard good things from people who have. Below is a link to the page for the size you need for your machine. Based on where you are I would suggest the "2 link ladder" if you have more snow but on a good gravel footing, and the "ladder v-bar" if you have lots of snow, but get ice below it on occasion. Chains on the front is a problem for 4WD don't do it! Unless I was on sheer ice with water running over it I would pass on the front chains. As Murf sez, there generally are restricted clearances there and the only thing likely to fit would be cable type chains. As far as tire-to-chain fit, there are two ways to approach it. One way would be to measure the width and height of your tires and then go to a tire store and find a truck tire with similar dimensions and buy the chains for that size. The other method is to buy a set of chains that you know are wide enough but too long and cut them down to fit. I have done that several times with good success. Option three: run a tape measure over the current R-4's and replace them with a radial mud and snow tire with the same or very close circumference. They will outperform the R-4's in every possible way. Lots of good info here. Thanks to all of you. In response to DennisCTB, about whether I even NEED chains with my B7800, you have a point-I don't know for sure. That is why I was so interested in this great discussion. I think it is the picture in my mind of my tractor stuck down in the big dip in my drive with no way to get up or down that made me think I should spend a few bucks on 'insurance'. ( I like the idea of 'crabbing' by using the FEL to pull the tractor body along - not sure I would have thought of that but I sure will remember it!). I slso like the idea of using radial winter tires. I use them on my car and they are remarkable. I will have to check to see if I can find anything that would work on those large rear tractor wheels. Murf, do you keep a separate set of wheels and tires ready for the winter, and just take off the 'summer' wheels and put on the winter ones? Did you find some kind of wheel with the right bolt pattern or use extra tractor wheels? Or do you mount the winter tires on your existing wheels? Frank, we only change tires when the tires are worn out. We used to run turf tires all year long, IMHO for snow clearing turf tires give a superior grip to any other (unchained) tire out there for a CUT. In recent years changes to the government contracts we have mean we now must run R4 tires on all machines working under those contracts. DRankin (and others) have had excellent results running pickup truck tires all year round also, unfortunately my machines are too big for that solution. Don't forget, in most cases, the tractor will not be driving through deep snow, the snow is removed by the blower or blade, the tire is running on the newly cleared ground behind that blower or blade. I'd have to say that less then 1% of the compacts we sell get chains. One of the examples we use is here is at our local school. They use a M-6800 with a 10' snow buncher on the front and a blower on the back which mainly takes the banks and cleans the energency exits on the back of the building. This tractor is on turf tires! They wanted rear chains when they purchased it do to the amount of driveway they clean with it. It has become the primary cleaner as the operator often starts and 3 in the morning to clean the two main complexes and they found it to actually be better then the trucks although they do come in later to help when we get a lot of snow. The thing that might be interesting to you is they only installed them once, they were on for two days and removed and not installed since! For industrial tires, let the air down below ten lbs on the rear and you should have good traction.